Adrien Broner isn't giving his next opponent much respect and won't discuss recently surfacing felony charges. His stance on Floyd Mayweather is harder to pin down. Two days before he defends his WBA super lightweight title against Ashley Theophane, Broner griped that Mayweather missed the press conference for a fight he helped organize, and mockingly referred to "Hateweather Promotions." Later, though, Broner told a scrum of reporters that the link between him and the retired champion isn't all that frayed. 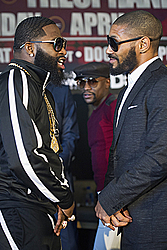 "To be honest, ain't no beef between me and Floyd," Broner said. "I'd do this in front of Floyd. When we're by ourselves, I talk (stuff) about Floyd. I talk (stuff) to Floyd. But, you know, me up there saying, 'Hateweather Promotions,' I'm just having fun. I hope ain't nobody take it personally." Broner, 26, has drawn comparisons to the retired 39-year-old Mayweather throughout his career for his counterpunching style and bad boy image. In the ring, he has won world championships in four weight classes, though at 34-2-1 (23 KOs), he lacks Mayweather's unblemished record. Outside of it, reports surfaced last week that Broner is wanted in his native Cincinnati for assault and aggravated robbery. Broner declined to comment on the issue. Because the warrants reportedly only apply in Ohio, the fight is expected to go on as scheduled. Mayweather and Broner have traded barbs since last fall after Broner launched his own About Billions Promotions last summer. It has grown more heated with February's announcement of the fight against Theorphane (39-6-1), a Mayweather Promotions boxer. "It's obvious that we wear our feelings on our sleeves," Broner said. "Anything that we feel or anything that we say about each other, we don't care who hears it. Because at the end of the day, it's not going to break up our relationship." The British Theophane, 35, has won six straight bouts and will try for the victory of his career at the DC Armory in a fight airing on Spike's Premier Boxing Champions series. Broner showed no deference to Theophane or general standards of decorum on Wednesday, fumbling with his phone on stage during Theophane's remarks, before promising a knockout and blasting the journeyman's lack of stardom. "I ain't used to fighting on Friday," Broner said. "He probably is, on FOX and Friday Night Fights, but I ain't used to that. So as long as my payday is right, we're good." 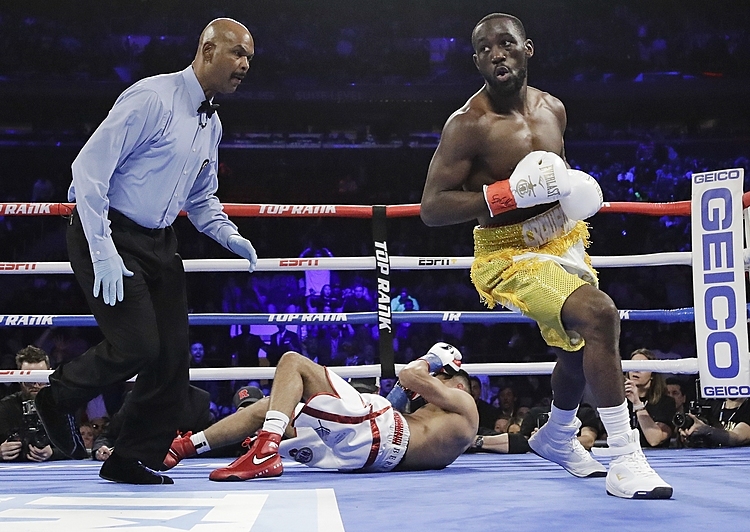 He also defended his outsized antics, saying quieter black fighters risk being underrated compared to white or Hispanic fighters. And while trying to mend fences with Mayweather, he took a shot at his former managers, Oscar De La Hoya's Golden Boy Promotions. "They're there for Mexican fighters," Broner said. "I have nothing against that because Mexicans (are) almost who run boxing. That's the biggest population, and they watch boxing. I love Mexicans, I have nothing against Mexicans, but at the same time, promote the African-American fighters the same way you promote your Mexicans."